Instantly access through Monflo your favourite movies, music, application, web browser and PC games. Create favourite apps lists for easy and quick access. Monflo’s easy and intuitive interface won’t let you get lost while remoting from your Android device or another PC. with Monflo’s free version for personal use. Connect your devices Android devices to Windows PC and play games or watch movies in up to 720p quality of streaming. You can access your personal computer from wherever you are. All you need is a second device, another PC or Android smartphone or tablet, and the Internet connection, any Wi-Fi hot spot will do the job – Monflo allows you remote access despite any limitations of the network – firewalls and NATs are not a problem. Access your PC from work, to get any files you left at home, or from friend’s computer, to show him the performance of the connection and your hardware. Use Monflo to access any files and data stored on your personal computer wherever you are and whenever you want. Read and edit your text documents, have access to all your pictures – edit them from your mobile device using applications from your PC! With just few clicks or finger taps you have instant access to everything you need. Do not let the distance be an issue. Use Monflo Remote Control Software to fill your free time entertaining yourself by watching all the movies and music videos from your Windows PC. All video files, as well as your Internet browser, are now available on your client device. Access your PC video editing applications from server device and change and edit your video wherever you are. Change your Android smartphone or tablet into portable game console with full PC functionality. Play any game you have installed on your Windows computer. Fully customizable control system allows you to play any game you want with no exceptions! Remote gaming have never been so easy and comfortable -enjoy it with Monflo to its fullest! Have a presentation and forgot your laptop? It will not be a problem anymore. Just connect to the PC you want to remote from, connect your Android device to the projector and it is done. Monflo will save whenever you need to share your desktop through a mobile device, even a smartphone, and show presentations to your public. Use it in any way you need it! 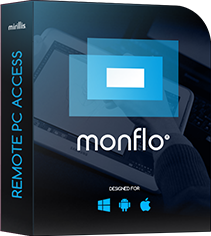 Use our Monflo Remote Access Software for remote desktop access of your family and friends' PCs for technical maintenance. Provide swift help on any matters without leaving home or office with no additional installation and settings. Easy and user friendly Monflo’s interface is transparent and understandable for even inexperienced PC users. Help your friends and family to fix any computer problems swiftly and from home. Fill your free time by using Monflo for entertainment, watch movies and play PC games.